Tue Aug 22, 2017 Controversial practice of 'triple talaq', which allows men to dissolve marriages instantly, declared unconstitutional. The supreme court in Delhi took up the issue last year in response to a petition from seven victims and women's groups. A majority of the bench declared on Wednesday that triple talaq was "not integral to religious practice and violates constitutional morality". Campaigners hailed the supreme court's 3-2 decision as a huge victory for India's 90 million Muslim women. TRIPLE TALAQ is an Islamic practice permitting men to instantly divorce their wives has been declared unconstitutional by India's supreme court after decades of campaigning by women's groups and victims. The "triple talaq" has allowed Muslim men to dissolve marriages by pronouncing the word "divorce" three times. UPDATE: Dec 01,2017: Draft law proposes ban on instant triple talaq, with three year jail term. The government plans to introduce the Muslim Woman Protection of Rights on Marriage bill in the winter session of Parliament that starts on December 15. 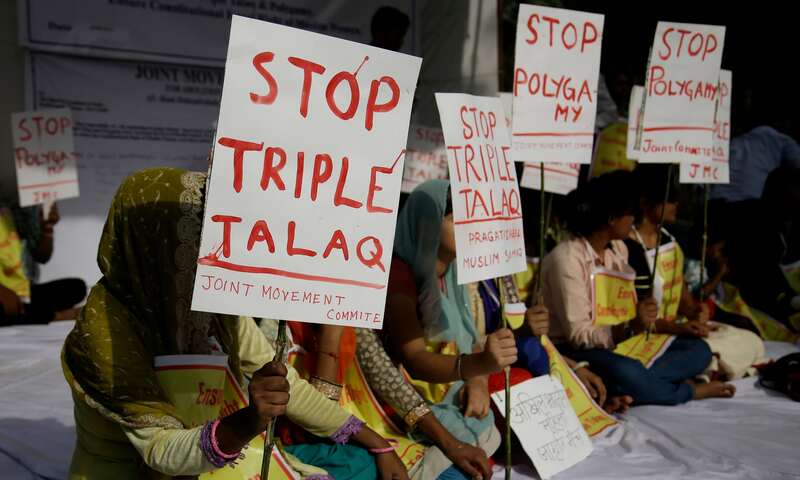 The Union government has told State governments to urgently revert to the provisions of a draft law to deal with instant triple talaq or Talaq-e-Biddat that provides for a maximum jail term of three years.Once the proposed Muslim Woman Protection of Rights on Marriage bill is approved by Parliament, the law will adjudicate all cases of instant triple talaq across the country, except Jammu and Kashmir. UPDATE: Dec 28, 2017:The Lok Sabha has passed a bill that makes instant "Triple Talaq" a criminal offence and proposes a three-year jail term for a Muslim man who divorces his wife by uttering the word "talaq" thrice. The bill will now be sent to the Rajya Sabha, where it is expected to face rough weather. Prime Minister Narendra Modi said at a meeting of BJP parliamentarians this morning that he hopes the bill will be passed in parliament with the consensus of all parties. Aug 30,2017. Gorakhpur: A total of 296 children died in the Baba Raghav Das Medical College here in the month of August, principal PK Singh said.He added that of these, 213 died in the neo-natal ICU and 83 in the encephalitis ward. The principal said that children with different complications and ailments arising out of premature delivery, being underweight, jaundice, pneumonia, infectious diseases and encephalitis were admitted to the hospital, mostly in a very serious condition. "A lot many lives can be saved if patients are brought here earlier," Dr. Singh stressed. It was said at that time that over 60 children had reportedly died at the hospital since August 7, many for want of oxygen whose supply was disrupted after bills were not paid to the vendor. Acute Encephalitis Syndrome (AES) and Japanese Encephalitis (JE) have been creating havoc in eastern UP for years. The most severely affected districts are Gorakhpur, Maharajganj, Kushinagar, Basti, Siddharthanagar, Sant Kabir Nagar, Deoria and Mau. December 01,2017:Cyclone Ockhi has claimed 13 lives in Tamil Nadu and Kerala.Kanyakumari, one of the worst affected, remains largely powerless.Several fishermen are still missing and rescue operations are on and warships have been deployed to comb the southeastern coast for fishing boats missing in wild seas. As many as 531 fishermen, stranded in the choppy waters off the Kerala and the Lakshadweep coasts due to Cyclone Ockhi, have been rescued, Kerala Chief Minister Pinarayi Vijayan said today. So far 393 people from Kerala have been rescued, Mr Vijayan said, as the state government announced a compensation of Rs. 10 lakh to the family of those who died in the storm. Tamil Nadu's Kanyakumari district, one of the worst affected, still remains largely powerless with more than a thousand people stranded in rescue centres. The district has received moderate rainfall this morning and a few low lying areas there are still inundated. 4,000 power lines in the district have been damaged by the cyclone and officials said it may take close to a week for the entire power supply to be restored. The Tamil Nadu government has released Rs. 25 crore to restore power supply in the district. As many as 39 people have perished and 167 fishermen were still missing after cyclone Ockhi hit Tamil Nadu and Kerala coasts while 809 others were swept away to Maharashtra, the union home ministry said Tuesday Dec 05,2017. Tamilnadu Government has sent the rescue team and its high level officials to Gujarat coasts where most of the fishermen from Tamilnadu and Kerala were drifted along the cyclone to the Gujarat coast. Interim relief Rs:5000 per person and 1000 literes of Disel per Boat ,to return home was granted by Tamilnadu Govetnment.